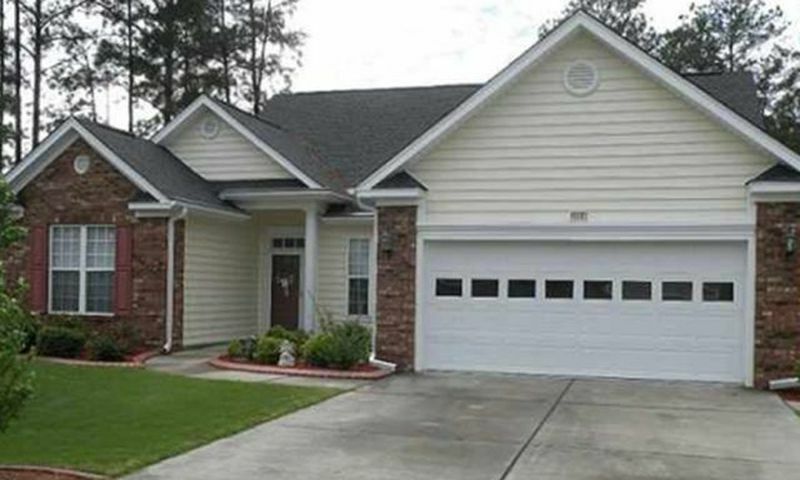 Myrtle Trace South is a quaint 55+ community located in Conway, South Carolina. Built along the fairways of the Burning Ridge Golf Course, this scenic community offers homes with great golf course or water views. Residents of Myrtle Trace South enjoy a private clubhouse full of amenities. Situated close to Myrtle Beach the surrounding area offers endless opportunities for entertainment and recreation. Low-maintenance, well-built homes with numerous amenities make Myrtle Trace South a great community for active adults. Residents of Myrtle Trace South enjoy great amenities inside a private clubhouse. For residents who are more socially minded there are numerous card clubs that meet in the multi-purpose room. Numerous community parties also take place in the clubhouse. Directly behind the clubhouse you will find the resort-style pool. Residents often beat the summer heat with a refreshing dip. Myrtle Trace South was started by Hall Development Corporation in 2005 and at completion will consist of 150 single-family homes. While Hall Development Corporation is no longer building, Sterling Homes is assisting homebuyers in building the custom home of their dreams on one of the last remaining lots. Homes in the community offer low-maintenance living with two to three bedrooms, two to three-and-a-half-bathrooms and an attached two-car garage. All homes offer first-floor master suites and some offer second-story lofts perfect for an office or den. Each home backs up to either a golf course view or scenic wooded areas. Residents of Myrtle Trace South enjoy a low-maintenance lifestyle. Homeowners pay an annual association fee which covers the general maintenance of the community grounds and amenities as well as the lawn care and trash removal for all homes in the community. This allows residents to enjoy all the great clubs and activities in the community. Instead of keeping up with the lawn care homeowners enjoy meeting with neighbors and friends for card clubs, bingo, book club, and travel club. With numerous clubs there is sure to be something to fit everyones' interests and hobbies. Located in Conway, South Carolina, Myrtle Trace South is surrounded by beautiful scenic views and endless opportunities for shopping, dining, and medical services. Situated less than 30 minutes west of Myrtle Beach this community offers a quiet lifestyle without being too far from all the action. Residents often plan day trips to one of the many beaches along the Atlantic Coastline. Golfers will love the numerous private and public courses in the area with play for all skill levels. Boaters enjoy the series of lakes that connect to each other starting in Conway and eventually leading to the Atlantic Ocean. Myrtle Trace South is surrounded by a beautiful area offering great amenities both in and outside of the community. There are plenty of activities available in Myrtle Trace South. Here is a sample of some of the clubs, activities and classes offered here. Homes in the community offer low-maintenance living with two to three bedrooms, two to three-and-a-half bathrooms and an attached two-car garage. All homes offer first-floor master suites and some offer second story lofts perfect for an office or den. Each home backs up to either a golf course view or scenic wooded areas. Sterling Homes is assisting new homebuyers in building the custom home of their dreams on one of the last remaining lots. 55places.com is not affiliated with the developer(s) or homeowners association of Myrtle Trace South. The information you submit is distributed to a 55places.com Partner Agent, who is a licensed real estate agent. The information regarding Myrtle Trace South has not been verified or approved by the developer or homeowners association. Please verify all information prior to purchasing. 55places.com is not responsible for any errors regarding the information displayed on this website.